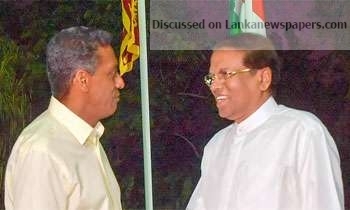 Seychelles President Danny Faure had requested President Maithripala Sirisena to assist in granting military training opportunities to Seychelles security force members in Sri Lanka. President Faure has made the request during President Sirisena’s two-day State visit to Seychelles. The Seychelles President has also requested Sri Lankan counterpart to assist them in obtaining training for judicial and legal drafting sectors. He has praised President Sirisena’s initiative to eradicate drug abuse and requested his assistance to find a solution to the drug menace, which is a threat to his country too. The two leaders agreed to take forward the strong relations between Sri Lanka and Seychelles in the fields of trade and tourism. During the bilateral meeting held at the State House, President Sirisena said that he would give instructions to the relevant sectors to improve the relations between the business forums of both countries. The President also noted he expected to get more Sri Lankan businessmen to participate in a trade fair to be held in Seychelles at the end of this year. Expressing his views, Seychelles President Faure said that he was grateful for the assistance given by Sri Lanka not only as a friend but like a brotherly State. The President of Seychelles also stressed that they were ready to provide support to Sri Lanka to develop the fields of economic and trade sectors as well as to provide any support to Sri Lanka at any time. The President also held a meeting with the Sri Lankans living in Seychelles. Sri Lankan professionals who are employed in Seychelles and the students who are being educated in different fields in Seychelles were present at this event, where all of them warmly welcomed President Maithripala Sirisena. President Sirisena returned to Colombo last morning.